These classes are offered for all students K-12. First Communion is a two year class offered for students in the first grade and culminating the following year with First Reconciliation and First Communion. After First Communion, continuing classes are offered to teach bible lessons, praying the Rosary, and other preparations for Confirmation. Confirmation is a two year program in preparation for the Sacrament. It is offered to students fourteen years of age. Students must be at least sixteen years of age when they receive the Sacrament of Confirmation. 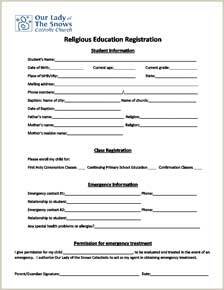 Please download and print the form below and mail it to the parish office at the address below or bring it with you the next time you attend Mass. The Registration Form above is provided in PDF format. Adobe Acrobat Reader is necessary to view and print it. If your PC is less than 6 years old, Adobe Acrobat Reader should be already installed on your system. If you need Adobe Acrobat Reader, it can be downloaded for FREE from the Adobe Website right here.